FIFA WORLD CUP Without Messi and Argentine ? 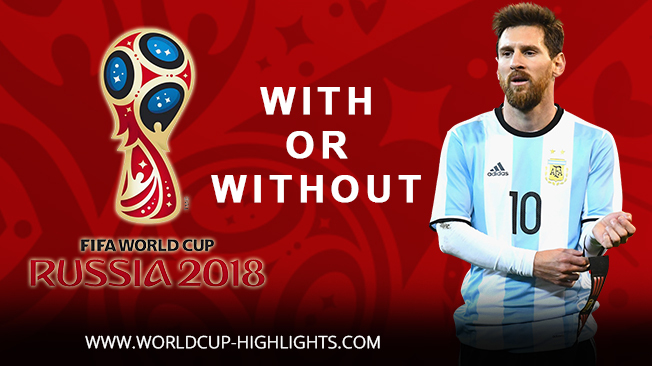 FIFA WORLD CUP Without Messi and Argentine ?. Barcelona legend Xavi admitted it is difficult to imagine the 2018 World Cup will not be followed by Lionel Messi. However, Xavi is confident that Messi will be present at the 2018 World Cup with Argentina. According to Xavi, it is difficult to imagine the 2018 World Cup to be held in Russia without the presence of Messi and Argentina. The reason, the figure of Messi can not be denied still be one of the biggest magnets in football. "I can not imagine the World Cup without Messi," Xavi told TyC Sports. "World Cup qualification in South America is the same as the European tournament, I'm sure Argentina will qualify and they will be one of the candidates for the 2018 World Cup winner," continued former Messi's colleagues at Barca. Messi opportunity to bring Argentina to play in the 2018 World Cup is currently under threat. Albiceleste still stranded in the 5th position of the CONMEBOL zone standings. There are only four countries that will automatically qualify from this zone. The country in the 5th position will struggle in the play-offs and meet with countries from other zones. Currently, Argentina has two games remaining to be able to secure a position in the top four standings. Xavi rate that the game Messi and colleagues are not optimal in this qualifying round can not be separated from the conditions that occur. Xavi regretted why the Argentine national team lacks appreciation and continues to get scathing criticism from supporters. "In Argentina, the players who played for the national team were less appreciated, the qualification went badly, I do not understand why criticism is given to the players of Argentina," Xavi concluded.